Want to remove the default “Sent from my iPhone” email signature that is added to the end of all your emails? You’re not alone! 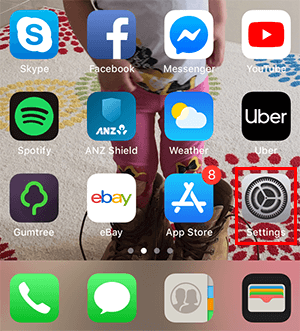 In this article, we’ll show you how to easily remove the “Sent from my iPhone” message from all of your outgoing emails. When you purchase an iPhone or iPad, you get an email signature that basically promotes the device every time you send an email to someone. After a while, it becomes annoying and many people remove it and replace it with their own email signature. Unlock your iPhone and tap the Settings icon. Scroll down and then tap on Mail. Tap in the text box and remove the text by tapping the backspace button. 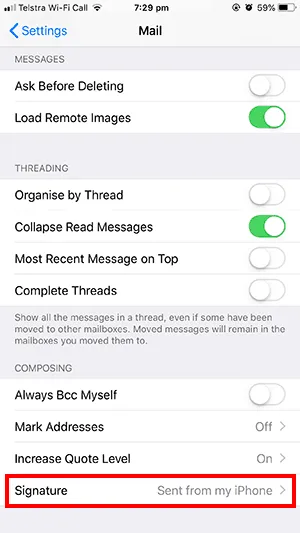 Once there is nothing left in the text box, you can tap back to go to the Mail settings and close out of the Settings section. Now when you compose a new email or reply to an existing email, you will no longer get the “Sent from my iPhone” signature at the end. If you want to replace it with another text-based email signature, you can just type your desired signature in the text box. However, if you’re using your email for work purposes, you should consider using a HTML email signature to get the most benefit. 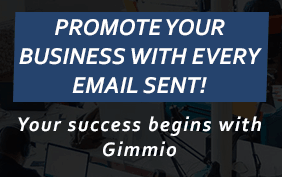 Some of the benefits are a higher response rate to your emails, higher click-through-rate for your marketing campaigns and much more. To create an amazing HTML email signature for your iPhone, you can quickly make one using our free email signature creator, and then install it on your iPhone by following our installation instructions. 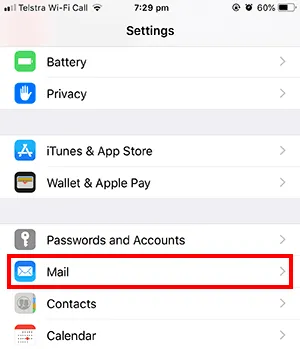 The steps to remove or change the default email signature for your iPad are the same as the instructions above for the iPhone. iPad’s and iPhone’s use the same operating systems which means the instructions are identical for both devices. 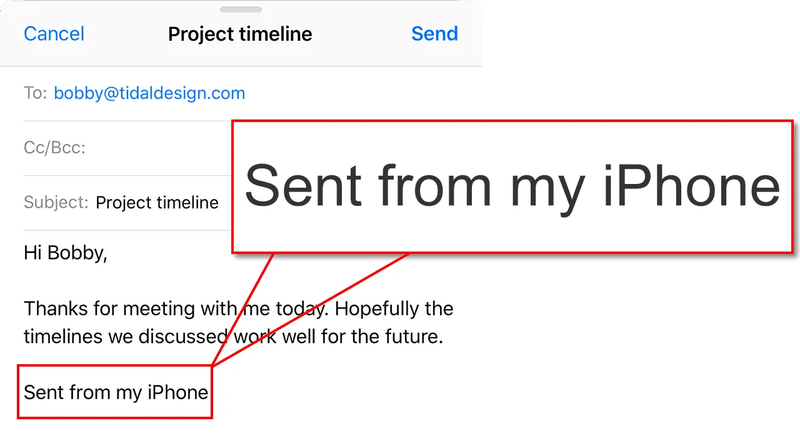 As explained earlier, when you’re using the Mail app on the iPhone or iPad, the “Sent from my iPhone” email signature is set by default. This is a sneaky move by Apple, but it does also have some upsides too (which we explain below). Typos allowed – It lets your recipient know that you’re using a phone to send the email, so typographical errors won’t be as frowned upon or seen as unprofessional. Everyone makes typos when typing on phones, so it’s expected. 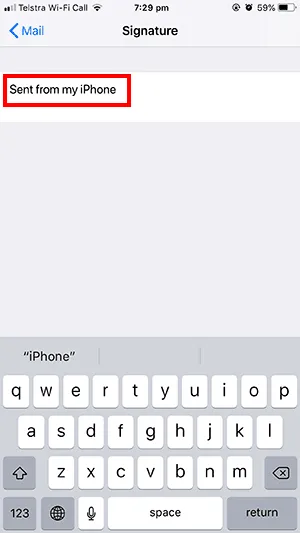 Shows that you’re always available – Responding to emails with a “Sent from my iPhone” email signature shows that you check your emails on your phone and are regularly available. Shorter replies allowed – When sending a normal email, it’s not always right to just say “Ok, see you then”. Instead, you’re almost expected to write something with a bit more content. When sending an email from your phone, it’s fine to respond with shorter answers. Using the default iPhone email signature has a few benefits, but it’s important to remember that its not a professional approach to branding yourself or your company. When it comes to email signatures, the best performing signatures are always created in HTML. If you’re just getting started and not sure what style of email signature you want for your iPhone, feel free to take a look at our email signature tool to create your own free signature.